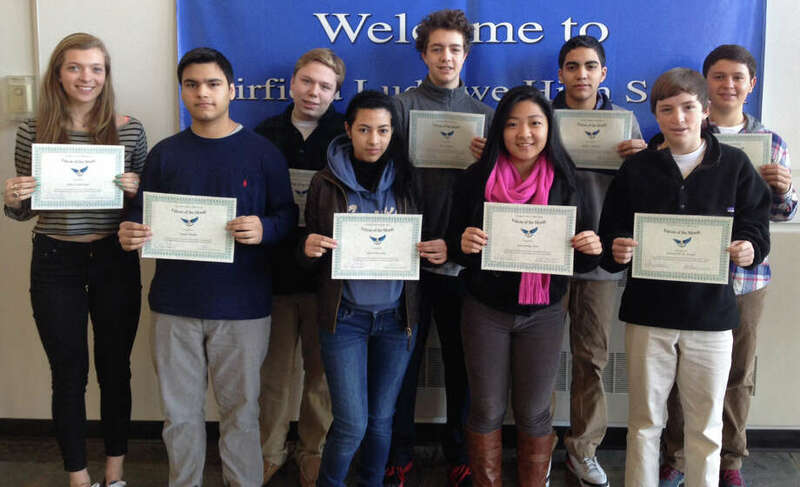 FALCONS OF THE MONTH Fairfield Ludlowe High School cited 11 students as Falcons of the Month for December. Ludlowe each month honors students for displaying a certain characteristic listed in the school's mission statement. That characteristic this month is having intellectual curiosity within and beyond the classtoom. Among the honorees are, from left, Glenn Holzinger, Ryan Malik, Peter Stack, Gloria Gavidia, Jack Savage, You Kim, Andres Melean, Alexander Kraus and William Russo. Honored but absent when the photos was taken were Kelly DeMeo and Ali Johnson. Fairfield Ludlowe High School cited 11 students for their intellectual curiosity this month, selecting them to be "Falcons of the Month" for January. Ludlowe each month honors students for displaying a specific characteristic listed in the school's mission statement. That characteristic this month is having intellectual curiosity within and beyond the classtoom. The honorees are: Kelly DeMeo, Gloria Gavidia, Glenn Holzinger, Ali Johnson, You Kim and Alexander Kraus. Also, Ryan Malik, Andres Melean, William Russo, Jack Savage and Peter Stack.